There will be a one day trip to Kilbeggan distillery and St. Mel’s Cathedral & shopping in Athlone on the 29th July which includes, scones, tea and dinner. The bus will pick up in Roundwood at Parish Hall at 9a.m. Total cost €70 per person. All monies must be in before 1st July. To book please contact Susan on 087 6273032. another day trip to Johnston Castle and Wexford town will take place on the 26th August which includes scones, tea and dinner. Leaving Roundwood Parish Hall at 9a.m. Cost is €70 per person. All monies to be in before 1st August. For further information please contact Susan on 087 6273032. 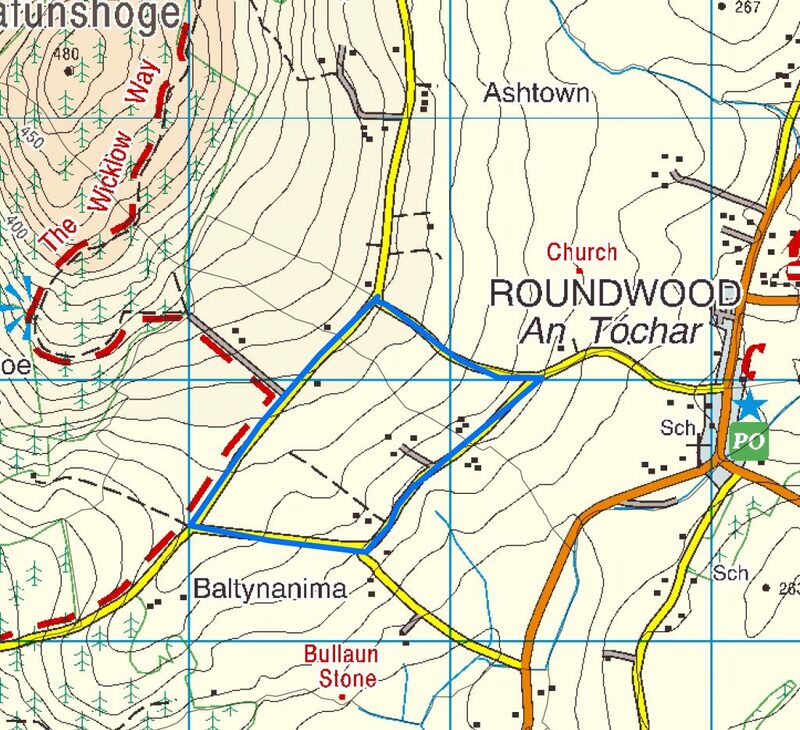 The Roundwood whizzers will have their last organised walk on Wednesday 28th of June leaving from the Coach House car park at 7pm. Well done to the great bunch of all ages who walked every week since last October. Thanks to Nollaig Cruise, Mary Dowling & all in Wicklow Local Sports Partnership who helped set up the group through the Roundwood & District Community Council. The group will be back in action in September, have a great summer & keep walking! There was no jackpot winner in last weeks draw. The numbers drawn were;- 4, 10, 23 & 24. There were four match three winners, Luke & Chloe, Majella McLaughlin, Miro Ludva & Leonone Earle. Next weeks jackpot will be 11,200. The 2017 Roundwood Street Festival is coming our way again soon and will take place from Wednesday, 2nd August to Sunday 6th August with plenty of activities of interest for young and old alike. An outline of the festival programme and more details are available on http://www.roundwood.ie. As all the plans fall into place updates will be posted on the website, Roundwood.ie facebook page and in the notice board in Roundwood village at Centra. This entry was posted in News & Events on June 26, 2017 by roundwoodiewicklow. The next concert in our 2017 series is on Sunday 25th June when the Delmaine String Quartet together with Michael James Ford, Gary Jermyn and Susannah De Wrixon will present ‘The Waterloo Concert’ with music, song, poetry and prose reflecting the great battle. It will incorporate works by Shostakovich, Beethoven and Schubert alongside pieces composed by the Duke’s own father, Garret Wellesley, who was the first professor of music at Trinity College. As this concert is being held to raise much needed funds to support Sister Mary Killeen’s work for street children in the slums of Nairobi, there is the option of a supper in the Church Room before the concert starts. The supper will begin at 6 pm sharp and the concert will start at 8 pm. Tickets for the supper and concert are €40 while those for the concert on its own are €18 and €15 for concessions. To book tickets, please ring John at (01) 2818146 or email derekneilson@eircom.net. There was no jackpot winner in last week draw. The numbers drawn were 3,4.27 & 29. There were five match three winners, Evan Cullen, Gerry Kavo, Nathan Osunbar, Jim McCabe & Sandra Carroll, Next week’s jackpot will be €10,900. A reminder that the Active Retirement Lunch club will take place on Friday 23rd June in The Roundwood Inn at 1.30. To book yourself in please ring Betty Cullen on 2818703. All deposits for our trip to Kilkenny in September should be paid on this day. Progressive 45 Card Game in Roundwood Parish Hall 18th June at 7.30pm in aid of St Vincent de Paul. Excellent Cash Prizes with Refreshments and Raffle at the interval. Men’s Shed: If you have a leg in need of repair – sorry – if you have a chair or stool or table with a leg or legs in need of repair we will be glad to try and carry out some repair work for you. One of the shedders has purchased a sewing machine and will be glad to carry out repairs to torn or holed jeans for any needy teenagers. We would like to express our gratitude to the RDCC for all the help, support and guidance which we receive in the shed. If you are familiar with the new technology you will ba able to see some photographs of the shed and the vegetable garden on roundwood.ie or the Facebook page. One of our shedders took his wife to Bloom recently to enjoy all the gardens and flowers. On the way home he asked what her favourite flower was. Odlums, she replied. Sure you never stop eating my scones and brown bread. Call 086 8650588 for any information about the shed. . 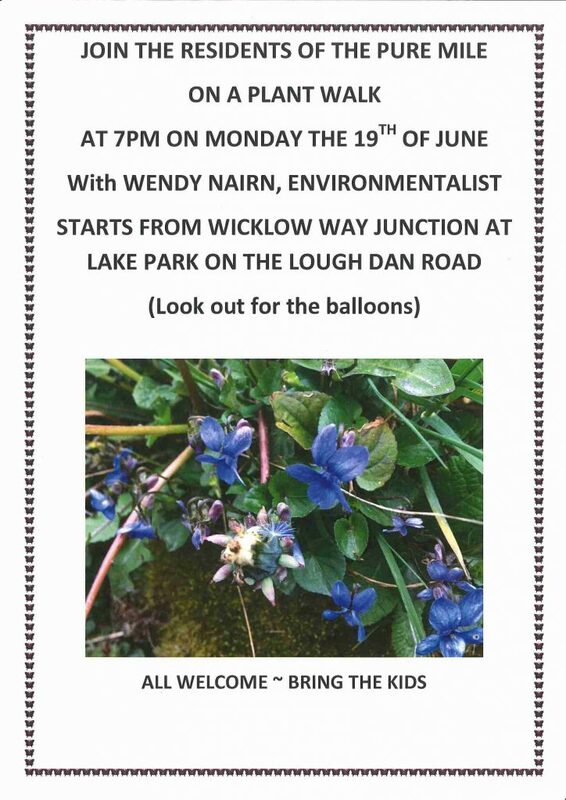 This entry was posted in News & Events on June 19, 2017 by roundwoodiewicklow. ‘The PURE Mile’ competition is an environmental initiative of the PURE (Protecting Uplands and Rural Environments) project which aims to foster a greater appreciation and awareness of our country roads by rewarding and acknowledging local community efforts. This is achieved through keeping a mile stretch of road and the immediate environment litter free, while simultaneously considering the preservation and careful maintenance of the flora and fauna, ditches, hedge-rows and any other natural or man made features of the area. Local residents and the Roundwood Tidy Towns Committee jumped at the opportunity to enter this competition and have won in various prize categories from 2010 to 2015. The Pure Mile this year is a popular for walkers so watch out for the improvements and events in the coming months. Check out the website www.baltynanima.com & feel free to email anything that you think might be of interest to Philip on liviacuthbert@gmail.com. All residents, landowners and the community at large at most welcome to get involved. This entry was posted in News & Events on June 16, 2017 by roundwoodiewicklow.